See you again soon, Toronto! We’ve just confirmed our attendance as an exhibitor at this year’s Whole Life Expo. Shawn Buckley joins the NHPPA team to update everyone on Health Canada’s most recent actions. We have free passes to share with our supporters! 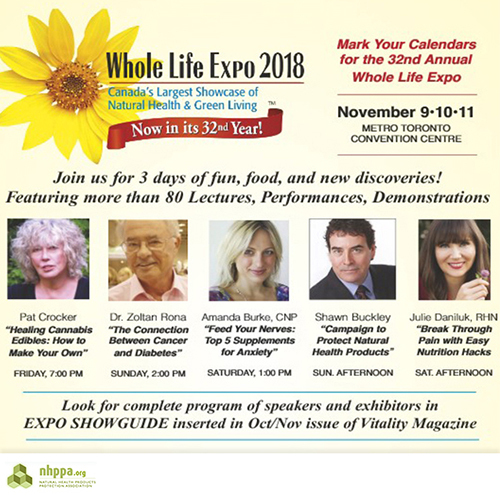 Visit our Facebook page, be one of the first 10 people to leave a comment letting us know what natural health product you can’t live without and why, and we’ll mail you a complimentary Exhibit Hall Pass! Watch for an announcement on NHPPA at a Calgary and Victoria show soon!